Superstar Scarlett Johansson takes a break from superhero duties as she plays the bride-to-be in Columbia Pictures' new bachelorette-party comedy Rough Night (in Philippine cinemas August 9, 2017). 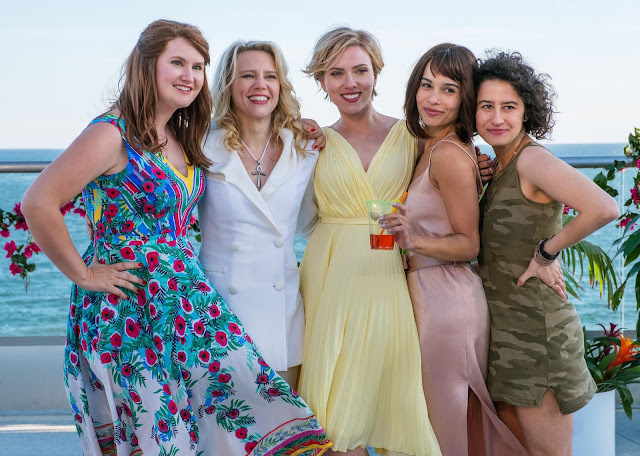 Also starring Kate McKinnon, Jillian Bell, Ilana Glazer, and Zoë Kravitz, Rough Night is about five friends from college who reunite when they rent a beach house in Miami for a wild bachelorette weekend that goes completely off the rails. Just when all hope is lost, they realize there’s more to the story than they could’ve ever imagined. “Jess is one of those people who has moved on from her crazy college days and is trying to forge a new life in a genuine, earnest way,” explains writer-director Lucia Aniello. Tony and BAFTA winner and four-time Golden Globe nominee Scarlett Johansson was most recently seen in the lead role of the Major in Ghost in the Shell, a live-action adaptation of the original Japanese manga. In 2016, she voiced the python Kaa in Disney’s live action/CGI animation adaptation of The Jungle Book from Jon Favreau, and lent her voice to the computer-animated musical comedy film Sing, in which she played punk-rocking porcupine Ash. She also reprised her role as Natasha Romanoff / Black Widow in Captain America: Civil War, and is currently filming the two upcoming Avengers movies, including Avengers: Infinity War. Her other recent roles include Luc Besson’s action-thriller Lucy, Jonathan Glazer’s sci-fi art film Under the Skin, and Spike Jonze’s critically acclaimed sci-fi romance Her, in which she played the role of operating system Samantha, which earned her a Best Actress award at the Rome Film Festival. She is currently the highest-grossing actress of all time and highest grossing actor of 2016, with her films making over $1.2 billion that year and $9.3 billion overall worldwide.